We’d love your help. Let us know what’s wrong with this preview of The Church Mice at Christmas by Graham Oakley. One morning a few days before Christmas, Arthur and Humphrey, the leaders of the church mice, decided to have a Christmas party. But parties cost money, and the mice would have to come up with some special fund-raising ideas. To ask other readers questions about The Church Mice at Christmas, please sign up. I read this as a child so was very pleased to find this again just before Christmas at a book sale. The illustrations are lovely, packed with detail and sometimes many on each page, you can see so much time went in to creating this book. The mice plan to have a Christmas party but being as poor as church mice they have no means of getting party food. They decide to raffle the church cat Sampson who has taken a vow not to eat mice. It doesn't go to plan but after an exciting adventure their party I read this as a child so was very pleased to find this again just before Christmas at a book sale. The illustrations are lovely, packed with detail and sometimes many on each page, you can see so much time went in to creating this book. The mice plan to have a Christmas party but being as poor as church mice they have no means of getting party food. They decide to raffle the church cat Sampson who has taken a vow not to eat mice. It doesn't go to plan but after an exciting adventure their party goes ahead and they have a great time. 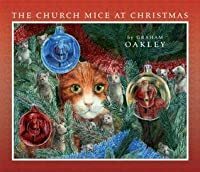 The Church Mice at Christmas is a whimsical and slightly surreal picture book, written and illustrated by Graham Oakley. It one of a series of half a dozen he wrote about the doughty, valiant church mice, and was first published in 1980. If you admire Reepicheep from C.S. Lewis’s Narnia Chronicles, you may well feel an affection for this little band of mice too. In the story the mice are getting excited about the imminent prospect of Christmas, and admiring the Christmas tree in the church porch. 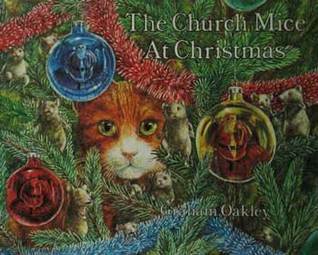 The Church Mice at Christmas is a whimsical and slightly surreal picture book, written and illustrated by Graham Oakley. It one of a series of half a dozen he wrote about the doughty, valiant church mice, and was first published in 1980. If you admire Reepicheep from C.S. Lewis’s Narnia Chronicles, you may well feel an affection for this little band of mice too. In the story the mice are getting excited about the imminent prospect of Christmas, and admiring the Christmas tree in the church porch. All that was left was for them to find a way to raise the money needed to buy supplies. They thought and thought, and then suddenly spied out of the corner of their eyes, their great friend Samson, the ginger cat, ambling slowly into the vestry. The Idea hit them both at the same time, and they smiled. They would raffle the cat! Samson wasn’t too keen on The Idea at first, but Arthur and Humphrey sweet talked him into it, and the great day arrived, with Samson proudly showing himself off, complete with a pink bow around his neck. A rather grim-looking couple won him, and carried him off home in their shopping bag, among all the cabbages and parsnips. Not surprisingly Samson is not happy in his new home, being given very meagre rations on an old chipped plate with a beetle scuttling about on it. He soon scuttles off himelf - back to the church vestry. The plan has fallen through, the money is refunded, and it is back to the drawing board for the church mice. The second plan they hatch also goes wrong in lots of different ways, each more zany than the previous one. “From then on it was just one thing after another. Fortunately Arthur kept his head ...” Even though by this time the police were after the mice, they fortunately escaped harm. The antics become ever more hilarious, involving Samson wearing reindeer antlers and longsufferingly being harnesssed to a sleigh, a total of three Father Christmases - or is it four? - not all of whom are real - a thrilling burglary, an heroic act by a policeman ... and of course the most superduper party imaginable - a veritable feast for our plump brave little warriors. The best children’s stories perhaps are those which can be enjoyed by both children and adults, and this one certainly fits the bill. It may be intended for young Johnnie, but you are just as likely to find Uncle Bill or Grandma chuckling over it after their Christmas pud. A lot of the entertainment value lies in Graham Oakley’s detailed and very mischievous illustrations, which well reward a careful look. There is a stereotype of an English country vicar, namely a doddery, slightly ineopt but genial old codger. We have that here, with him firmly ensconced in his vicarage. But Graham Oakley pushes the trope a little further, by making him watch a gruesome horror film on the television! In the stereotype, parish churches are old musty places, commonly thought to be infested by rats, and tend to have one cat living on the premises, to “keep the rodent population down” (but they are not usually best friends with the mice). Similarly it is a trope that those of the Anglican faith are always fund-raising, with fun events like church bazaars, garden fetes, jumble sales and rafflles (but not usually in aid of a party for mice!) These absurd ideas make the reader guffaw, yet are hopefully quite inoffensive to those of such a persuasion. A joy to read, the text of the story sometimes stops, with the action being told through more of these hightly detailed and expressive illustrations. The malevolence on the faces of the winning couple’s faces made me laugh out loud. although the story is quite suitable to be retold in simplified language to little ones, using the pictures as reference. "Good evening, Father Christmas sir. I am Humphrey, and what I want for Christmas is a quadrophonic record player, a quartz watch, four ounces of jelly babies, a pair of two-tone football boots, a - "
"And what I would like. . ." began Arthur.
" - transistor radio," continued Humphrey, "a dozen walnut whips. . .
. . the Beano album, a yo-yo, two pounds of fudge, an electric guitar, a - "
"And what I should. . ." began Arthur.
" - colour television," Humphrey continued, "six boxes of cheese spread, a cuckoo clock, a pocket calculator, and a packet of custard creams." "And what I. . . " began Arthur. Whenever the holiday madness grows too great, I retreat to this funny, sly tale (the words and the pictures don't match -- to great comic effect). Following the mice on their chaotic Christmas trip through their little town is more fun than a barrel of sugar plums. This book tried to be cute and I tried to like it. There is quite a bit of text and a lot of highly detailed pictures, but almost too many per page. The story itself was okay, although it was very British in feeling. I think it would have done better as an animated movie/cartoon rather than as a book. The middle of the story is rather tedious and the ending was just okay. So, we can probably skip this one. The cat-reindeer taking the Santa mice for a ride in their sled. My Least This book tried to be cute and I tried to like it. There is quite a bit of text and a lot of highly detailed pictures, but almost too many per page. The story itself was okay, although it was very British in feeling. I think it would have done better as an animated movie/cartoon rather than as a book. The middle of the story is rather tedious and the ending was just okay. Read this again today, it is as good as ever. Probably next year this book will be at my son's house for him to read to his little one. This is a lovely story for kids, and the illustrations are so beautifully detailed! The Church Mice at Christmas is my first 'Church Mice' book. How ever did that happen? The story and especially the detailed illustrations are quite sophisticated but does not negate the wonderful humor. I look forward to catching up with the other shenanigans of the "Church Mice"
Arthur and Humphrey are determined to have a Christmas party, but how are they going to pay for it? As usual, none of their plans go exactly as intended, but the party does eventually happen. Also as usual, the pictures are glorious, and poor Sampson is put to work. Aside from "A Christmas Carol" this is one of the few books I can honestly remember having it read to me as a little boy durng Christmastime. It was one of my favourites not because it was humorous but becaue my family shares the same last name as the author, and as a little boy stuff like that is important. Much to the chagrin of my wife I still have this book in our christmas-book pile, and I have read it to my chilrend a few times but the sharp wit seems a little too much for them right now. This is one book of a very funny series of books, in which the church mice run the church cat's life. 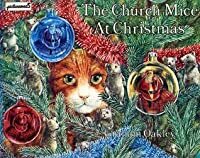 In this book, the church mice decide to raffle off the cat in order to obtain money to throw a Christmas party. Most of the cute illustrations are in panels, with a couple of full page spreads. As always, wonderful illustrations. Logan loves looking at all the details. We didn't laugh as much as we have with other Church Mice books though. 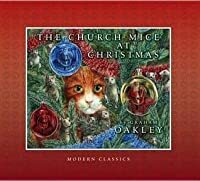 Christmas time aeries at the rectory and can a cat and his mouse friends survive the mayhem that is ChristmS at church? Only time will tell if Sampson the cat doesn't lose his whiskers! One of my favourite Church Mice books. I particularly love the illustrations of the mice running through the toy shop. 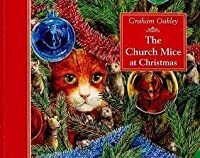 One in the series by Graham Oakley ... all are the adventures of the "church mice" and Sampson the cat ... wonderful ! The illustrations are exquisite !! I think this book was supposed to be funny, but the humor just fell sort of flat. It is about some mice who want to throw a Christmas party. The story is charming and the illustrations are amazing! Each picture is filled with so much detail that you will want to stop and study them. For the current UK author of children's books at Top That! press see Graham Oakley.